Clothes Moths known as Tineola bisselliella are a ever growing problem in UK households. Their presence at the larvae stage of development (rather than the moth stage) is when they will seek nourishment from clothing and carpets. The adult moths do not need to feed as they have all the nourishment they need from their consumption at the Larvae stage. Why do they keep eating my clothes and carpets? Clothes Moths prefer clothing that have either stains, liquids or sweat on. Likewise for carpet fibres. Miniscule amounts of dirt and moisture can provide essential food for the Larvae, enabling them to develop into the adult moths more commonly seen. How do I protect my clothes from Clothes Moth? 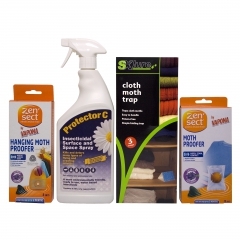 There are numerous products available to protect your clothes and carpets from moths and the damage they can cause. Working alongside a leading Pest control manufacturer, we recommend using a multi dimensional treatment of your premises to get rid of clothes moths. Firstly we recommend washing any clothes or bedding on the hottest temperature the labels allow. The hot water will both remove eggs and kil the moths or larvae on any of your clothing. Whilst your clothing is in the wash, we would set off a Fortefog smoke Fumer to kill any remaining moths or larvae in the room. The smoke will access all areas of the room, including areas inaccessible to humans. Follow all the instructions provided and set alight your recommend amount of Fortefog Fumers after sealing the room and then leave the room for 3-4 hours, preferably overnight if possible. > Once the smoke has dissipated after the 3-4 hour time period, re-enter the room and open all windows and doors and aerate for two hours. We would then recommend using moth killer spray to apply to the inside of wardrobes, cupboards, drawers, bed frames, windowsills and soft furnishings. Any moth landing in the sprayed area will be killed. The spray will last 4-6 weeks. Re-apply as neccessary. Vacuum any dead moths you find. For any moths you find/see in the room, we would use Protector FCIK instant kill spray that instantly knocks down and kills any moths or other flying insects within the room. 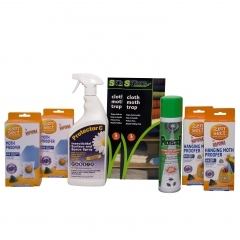 Set the repellents up and traps within your cupboards and wardrobes or areas where the moths congregate. We would strongly recommend repeating your initial treatment after 7 days to ensure any remaining moths are killed that were either missed from the initial treatment or were eggs/larvae at the time of treatment.